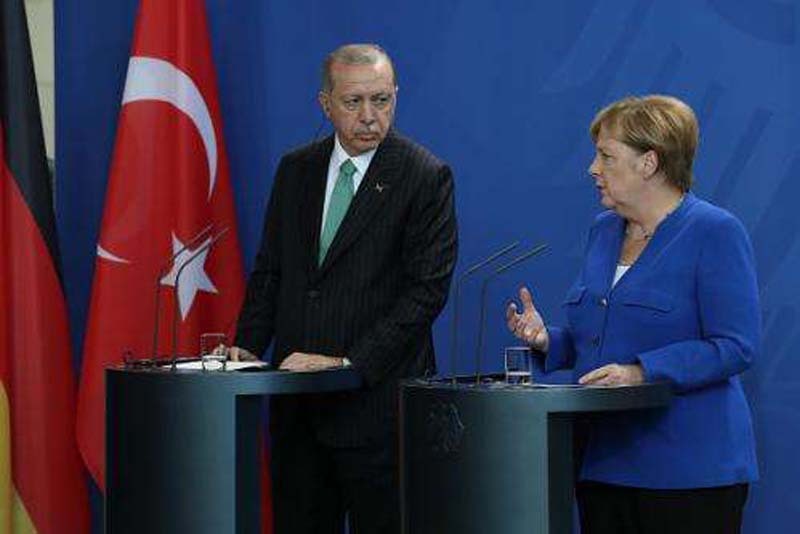 Turkey’s President Recep Tayyip Erdogan is urging Chancellor Angela Merkel to send Germany-based affiliates of an Islamic cleric back to Turkey to be tried as terrorists. During a visit to Berlin this week, Erdogan said that Germany should designate all followers of U.S.-based cleric Fethullah Gülen, a former ally of the Turkish president who is now living in Pennsylvania, as terrorists. The call was made as Erdogan faces criticism for having allegedly ordered the kidnappings of these so-called Gulenists from other foreign countries. Ever since he survived a failed military coup in July 2016, Erdogan has continued to consolidate power and purge the state of his enemies. Thousands of journalists, politicians and civil servants have lost their jobs and been sent to jail for allegedly supporting Gülen and the coup plotters. Erdogan blames Gülen's supporters for the coup and has lobbied consistently to have the cleric extradited from the U.S. But both the Obama and Trump administrations have refused to extradite the 76-year-old Turk because Erdogan’s government has not presented sufficient evidence that Gülen has committed a crime. Officials in Germany have also said they need more time to analyze the situation. Gülen, meanwhile, has denied any involvement in the military coup. At the same time, Gülen’s ideological movement has established private schools in over 100 countries around the world—including in the U.S.—and his followers regularly teach in these schools. Ankara has used its diplomatic relations to pressure these countries to close the schools and extradite the teachers, but sometimes Turkey resorts to force. In July, a Turkish teacher who was kidnapped in Mongolia was freed when Mongolian authorities learned about the incident and grounded the flight that was leaving the country to take him back to Turkey. In Kosovo, a country Turkey views as part of its sphere of influence, six Turkish men were suddenly deported in April without access to lawyers or due process. Reports in Turkish media claimed that the men had been extradited with the help of officials in Kosovo, but the incident later split members of the government who appeared to be caught by surprise. Kosovo’s Prime Minister Ramush Haradinaj later dismissed the country’s interior minister and head of the intelligence agency over the incident. Officials from Kosovo told Newsweek that Erdogan had planned to kidnap around 100 individuals from their country, and that the government is working to prevent such incidents from repeating. Previous reports also claimed that Turkish officials had enlisted the aid of former Trump national security adviser Michael Flynn to kidnap Gülen from Pennsylvania and have him sent back to Turkey, although Flynn denies the allegation. Erdogan and Gülen were close allies for decades, but their relationship fell apart in 2013 after the cleric criticized the way Erdogan dealt with street protests.